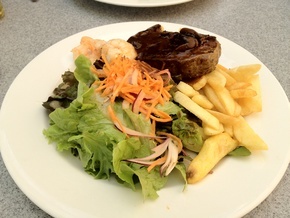 Captain Stirling Hotel was reviewed on Saturday 6th April 2013 11:45 by Richard. We headed down to The Captain Stirling Hotel on a sunny Saturday afternoon for an earlyish lunch and a few beers. My mate happens to be a native of the Nedlands/Cottesloe/Mosman Park area and seeing as I only venture down to the GT (golden triangle) once in a blue moon, I thought I'd hit him up for a recommendation on a pub to review in the area. He was adamant that we should try 'The Cap S' as it's known by locals. When we first arrived I could see why he suggested it, the place looked quite nice from the outside with a beer garden type area out the front. Walking inside the feeling wasn't quite the same, there's nothing particularly special about the place, a fairly standard looking pub with a handful of tables and chairs scattered throughout the joint and a big bar in the centre. They did have quite a few tap beers on offer and I was particularly excited about the little creatures pale ale, so we ordered a couple while we had a squiz at the menu. The barkeep plonked the pints down in front of us and straight away I knew they weren't pale ale. I'm no beer snob but I know a pale ale from something that looked more like a Pure Blonde. I raised my concern with him and was reassured that we had been given Pale Ale. We picked a spot outside to sit down for lunch and on closer inspection the beer garden was not as nice as it appeared from afar, in fact it's in desperate need of some general maintenance/tidying. We both had a few sips of our beers which confirmed my first thoughts, definitely not pale ale. We took them back to the bar for a switcharoo. About five minutes later the manager came by and apologised to us, turned out we were given Dry Dock (which happened to be the tap next to the pale ale). The menu is pretty standard for your typical suburban pub, with all the pub standards available. Matt went with a steak and I ordered a Chicken Parmigiana, hadn't had a decent parmi in a long while so was looking forward to it. Our food came out incredibly quickly (less than 10 minutes after placing our order at the bar). The steak was fairly average, nothing particularly bad about it, it just didn't quite hit the mark for a pub steak. 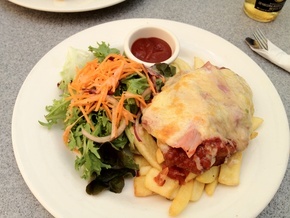 The parmi on the other hand was great, plenty of herbed napolitana sauce and a good chicken cutlet on the bottom. The chips however were a bit lack lustre and slightly undercooked. Overall the value wasn't great for the meals, prices weren't particularly high but neither was the quality of the food (with exception of the parmigiana), drinks were fairly priced though. We weren't blown away by the place and will definitely be passing on the feedback to my 'GT mate', however I'd be willing to give it another go one day down the track. 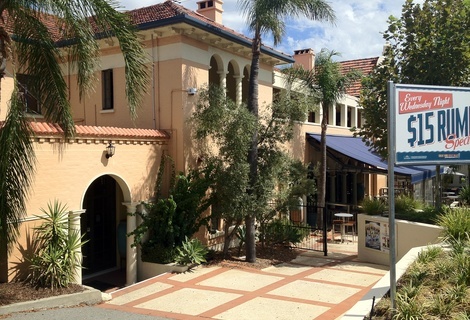 8/10The Byrneleigh in Nedlands, WA (1.2km away)Fantastic food with a rustic atmosphere.